I live in Pittsburg, KS. Southeast Kansas is no stranger to severe weather warnings. Four years ago, on May 22, 2011, the tornado sirens sounded. I unplugged my sewing machines, went in the basement, and watched the weather on TV. The storms didn’t materialize here, so I went back to work. A few minutes later, I checked the weather again. The same storm system that skipped us had devastated Joplin, MO, a town of 50,000. I’ve lived within 100 miles of Joplin, in several different towns, for the past 30 years, and for the past fourteen have lived here in Pittsburg, which is just 25 miles from Joplin. Joplin is where we go out to eat, to shop at Sam’s Club, to do anything we can’t do here in little Pittsburg. I watched the news in horror, to learn that one of the two hospitals was destroyed; over 40 doctor’s offices, many businesses and churches, the high school, part of a middle school and several elementary schools were gone. As the hours ticked by, we learned that more than 160 people had been killed; more than 900 were injured. About 8000 buildings had been destroyed. There wasn’t much I could do. I don’t drive a bulldozer, and I don’t have a chainsaw. Then, I got this idea… It became far bigger than I could ever have imagined! 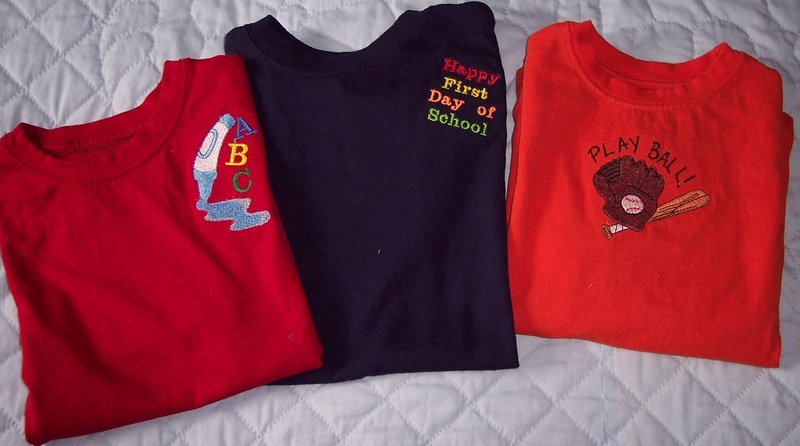 Most of my newsletter readers make children’s garments. 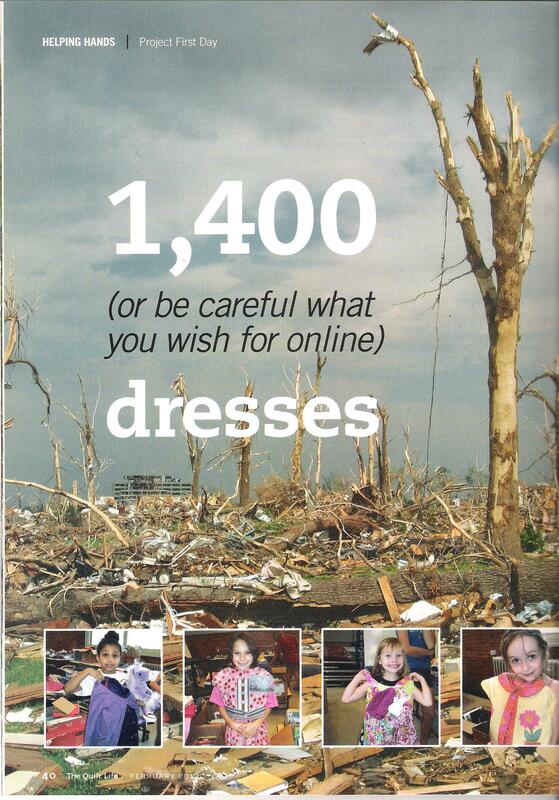 I sent out a newsletter asking them to please consider making one or more first-day-of-school outfits for children in Joplin who had lost everything. Well, within minutes my request had gone viral! I suddenly had a full-time job responding to questions about what I named Project First Day. Hundreds of people wanted to be a part of this. 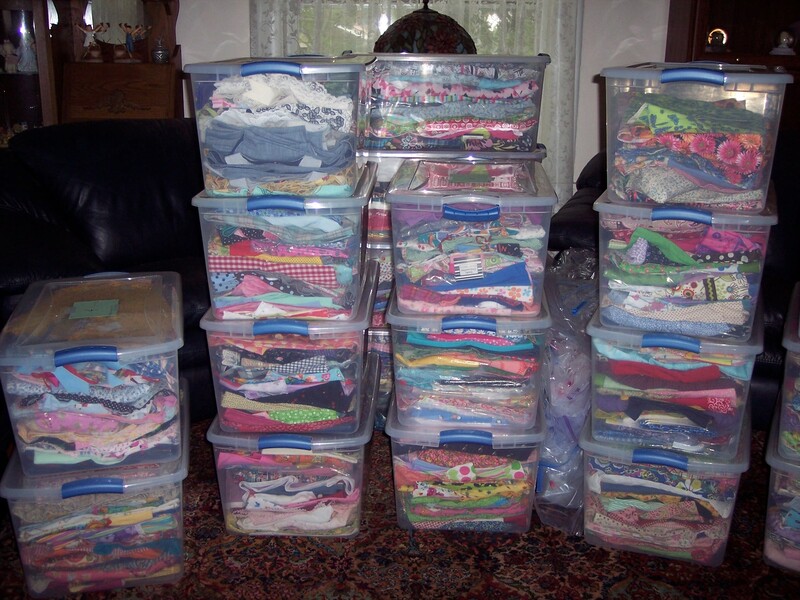 Lezette Thomason of Children’s Corner shipped out over 300 patterns at no charge for people to use to make garments. Kind people wanted to donate quilts and shoes and toys, but I had to respectfully say “no thank you,” as I only had one living room to store things, and, at the time, no way to distribute them! 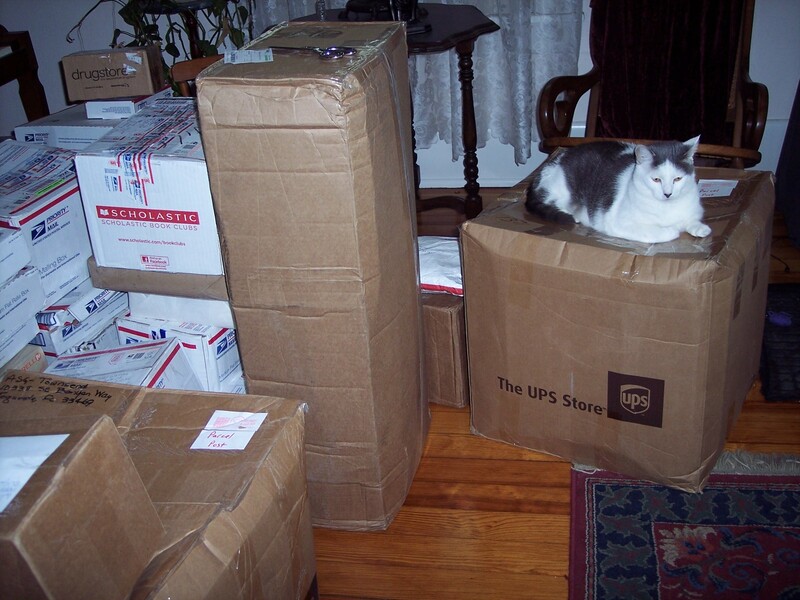 Soon, the boxes started arriving. I rented a post office box for the summer, and made daily trips to the post office. The workers soon knew my box number, and had me drive around to the back of the building and helped me load up my little car. I spent my days communicating with contributors, unpacking boxes, and sorting garments by size. 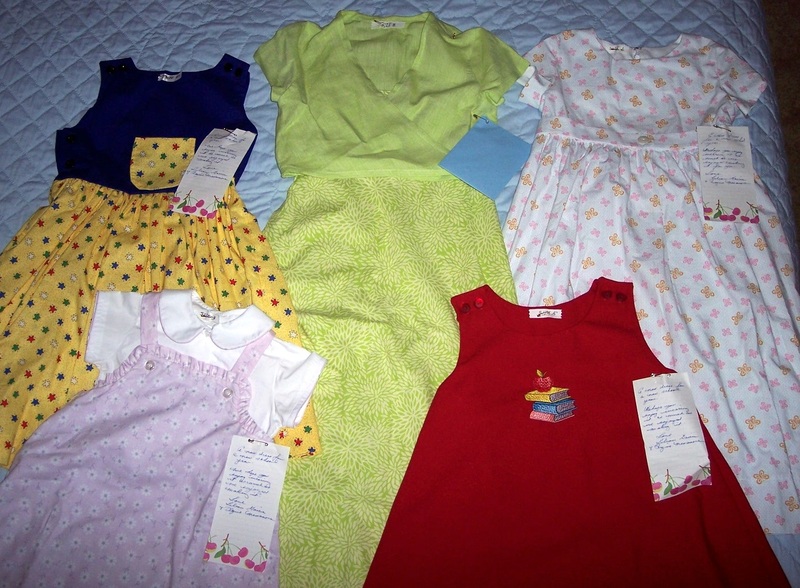 Several sewing guilds worked together to send hundreds of garments each. 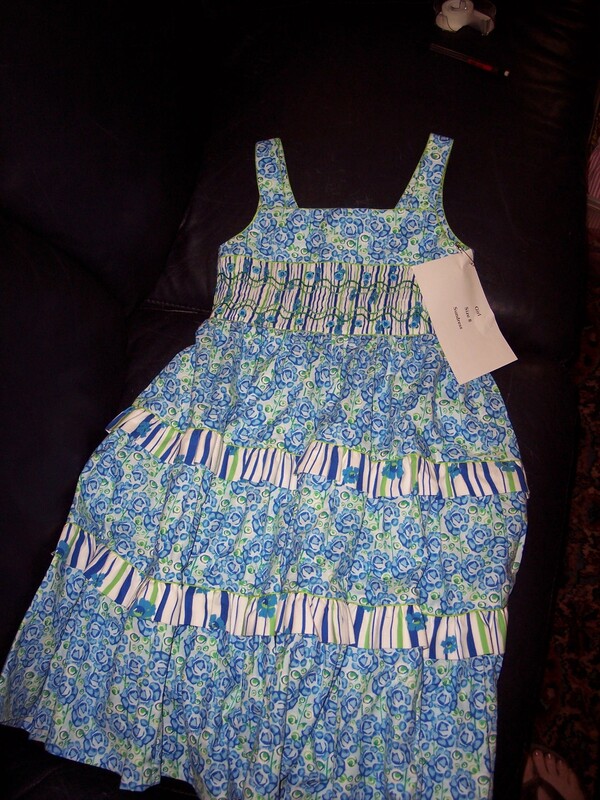 Each garment was an act of kindness from an anonymous giver to an unknown recipient. 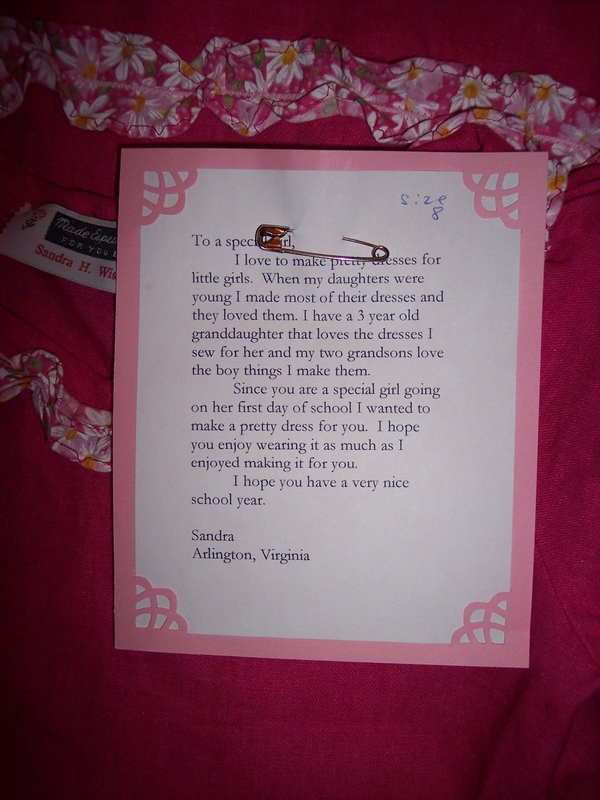 I asked people to write notes and pin them to the garments. Some of the notes were so touching – some wrote of losing everying thing in hurricane Katrina, and knowing what it was like to lose all your belongings. 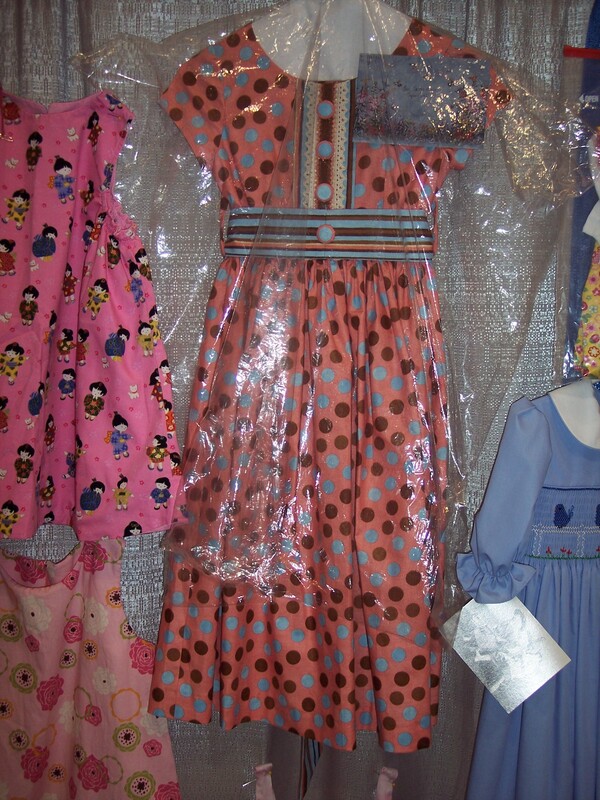 Eventually, I received 1474 outfits – some, single garments, while others were complete ensembles, including things such as embellished socks and hair bows. These are just some of the 38 big plastic tubs I packed up! 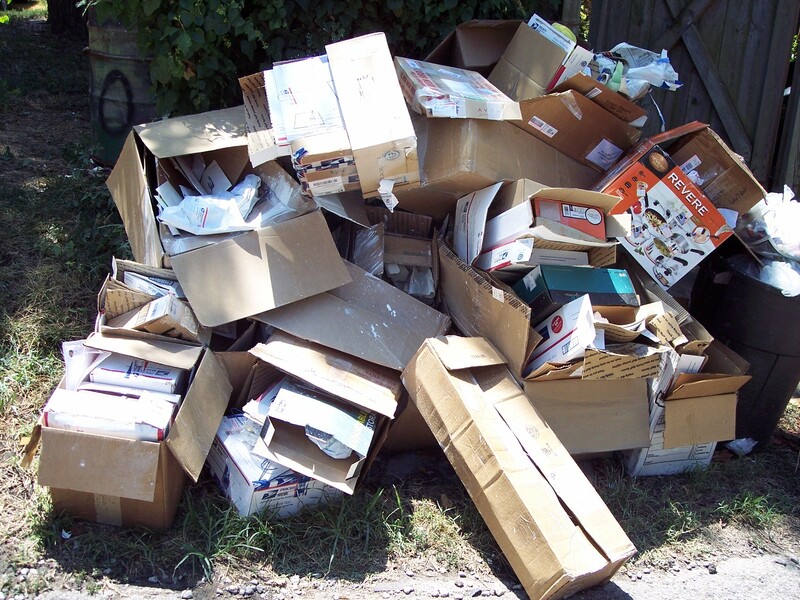 This is what the trash collection guys got to pick up one week! As the first day of school approached, I still didn’t have a way to distribute all the clothes. Charities were overwhelmed with other more pressing needs. I contacted the media, and finally, our local newspaper wrote an article about the project. A reporter for the Joplin newspaper saw the article and interviewed me. A local TV station interviewed me. The principal of one of the destroyed elementary schools contacted me. Finally, I had a way to get these things to the kids for whom they were meant! 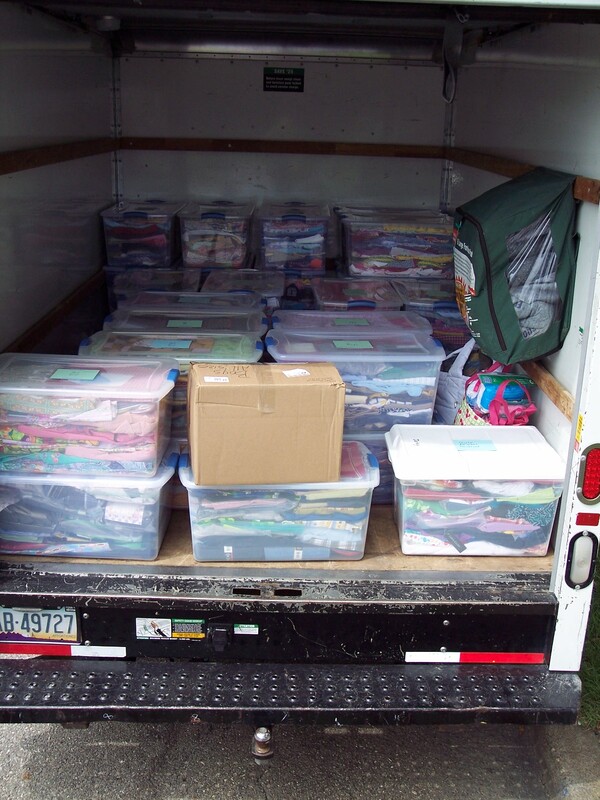 With just a couple days before school was to start, I rented a truck to take the tubs of clothing to Joplin, to the old retired school building that had been brought out of retirement to serve as the school for these kids. Well, the article in the Joplin Globe was picked up by the Associated Press, and what was a hectic few days became truly memorable. ABC World News Radio contacted me and I did a phone interview. CBS News contacted me and sent a reporter and photographer to my house. 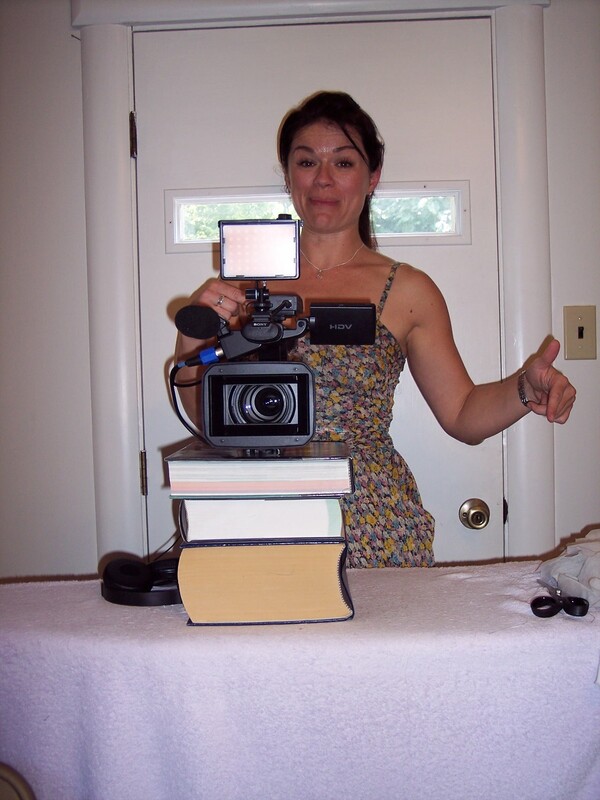 Here’s the CBS photographer with her camera set up on books on my ironing board! After the interview, I changed clothes and drove to Joplin for the distribution. 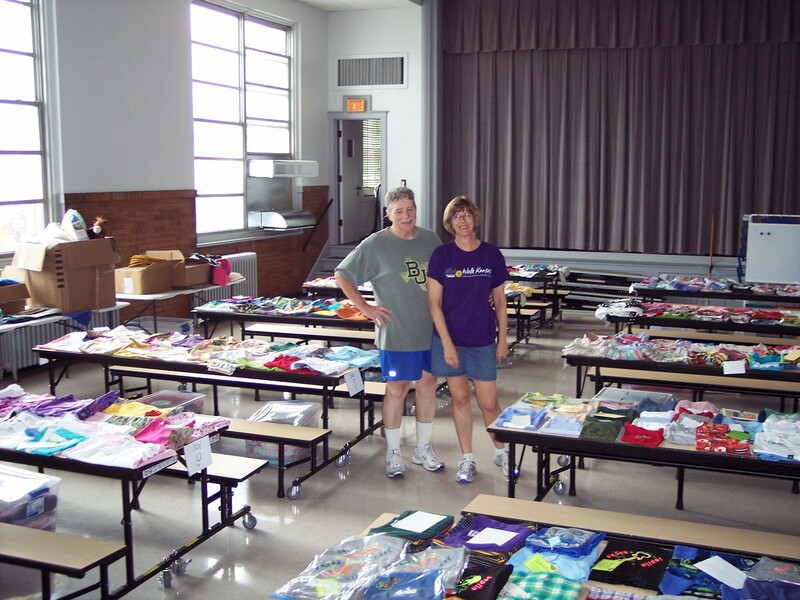 This is during set-up at Irving; some of the clothes had yet to be unpacked, and some went to other schools. It got a lot more crowded – and crazy – after this! Good Morning America did a piece on the distribution. My interview with CBS Evening News was on the next day. A month or so later, The Quilt Life magazine contacted me for an article, which appeared in the magazine. That was pretty much the end of Project First Day for me. And Joplin? The city has done a great job of rebuilding. The scars are still there, in the landscape, and certainly in the lives of many. The new Mercy Hospital opened a few months ago. The new Joplin High school opened last year. Our favorite restaurant was rebuilt and has been open for about a year and a half. And Irving Elementary School was rebuilt near the site of the old, devastated hospital. I haven’t been there, but photos of it show it to be a bright, colorful, beautiful place. Thanks to all those who helped make Project First Day a reality! 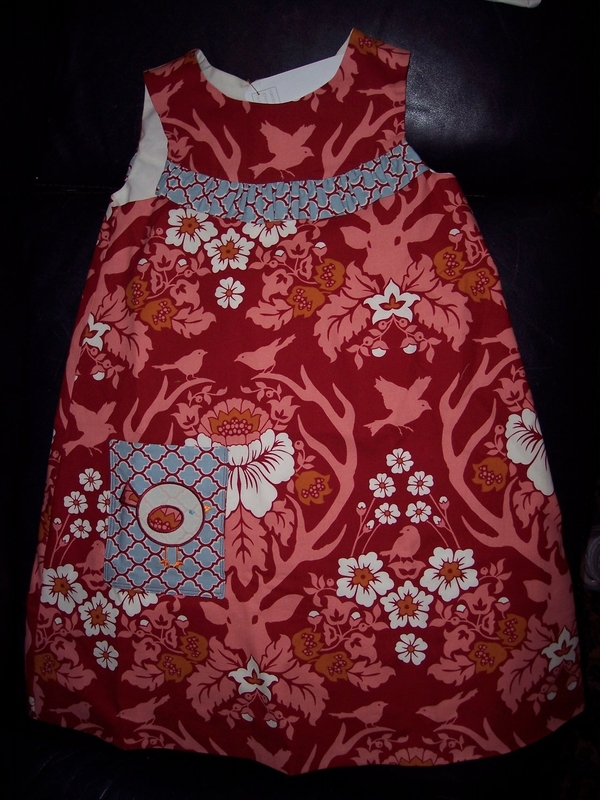 This entry was posted in Uncategorized and tagged Garments by susanstewartdesigns. Bookmark the permalink. Susan, what a wonderful project. I drove through Joplin the year after the tornado and I had never seen anything like that. ……………..and that was a year later and most of the debris had been removed. I didn’t know about this, or I would have made some clothes. Darn! Susan, I think I speak for many who are thankful you offered us this unique opportunity to feel we were helping. You actually made us happy, as well as all those children. I feel the same way. In the face of such huge devastation, so far away from where I live — not that I’d be of any more help if I lived closer — this was something I could grab onto and feel that I was answering a real need, and that made ME feel better. Thank you for your generous nature that sparked this idea. I hope it will live on as a response to other situations of devastation. I love seeing this. Wish I could just keep reading and seeing pictures of smiling children after such a tragedy. Well done, good and faithful servant. 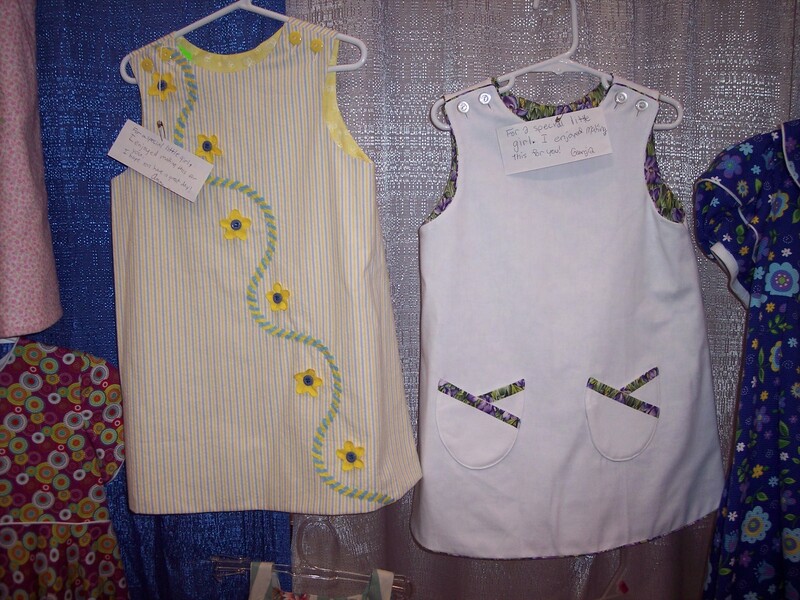 I’ve shared your note with my Hope Presbyterian Church ladies who made clothes for this project. It is good to read of the recovery of Joplin and be reminded of the generous outreach of so many sewers! Thanks again for all the extra effort you, personally, put into this project! I live in Joplin and wish to say a huge “thank you” to you for organizing this project and to all who contribute garments, prayers and good wishes. 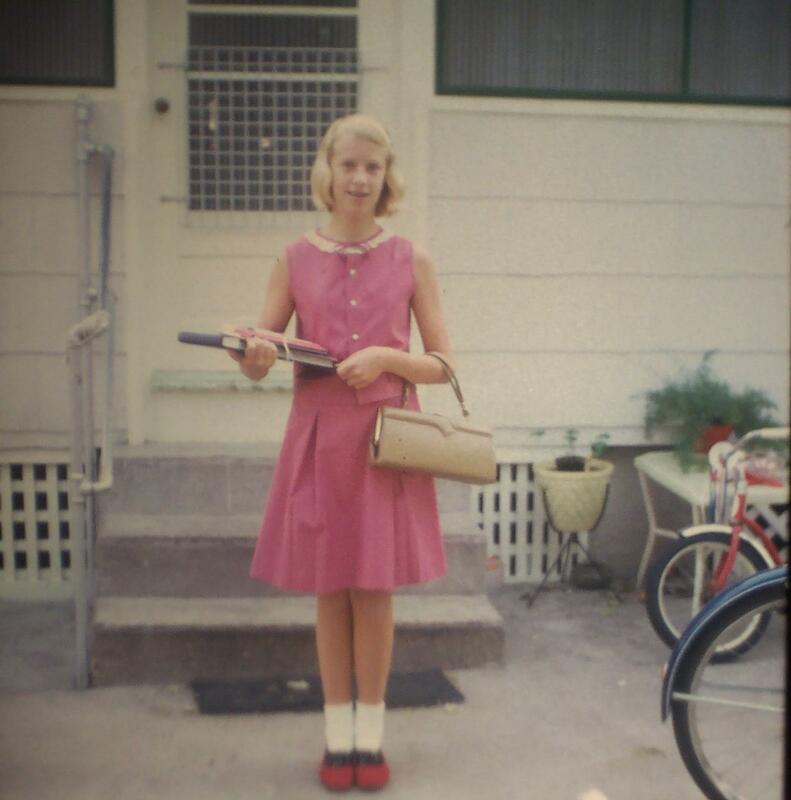 Dear Susan, Thank you for sharing this follow up to what was a remarkable act of kindness. You acted on your idea to help and many accepted your challenge! Wish there were more stories out there sharing the good in humanity. Well done! That was such a wonderful thing to do. I can not believe that it was four years ago. It seems like it was not that long ago. I was stunned at the pictures on the news. I can not imagine. I loved getting “the rest of the story”. What a great undertaking. 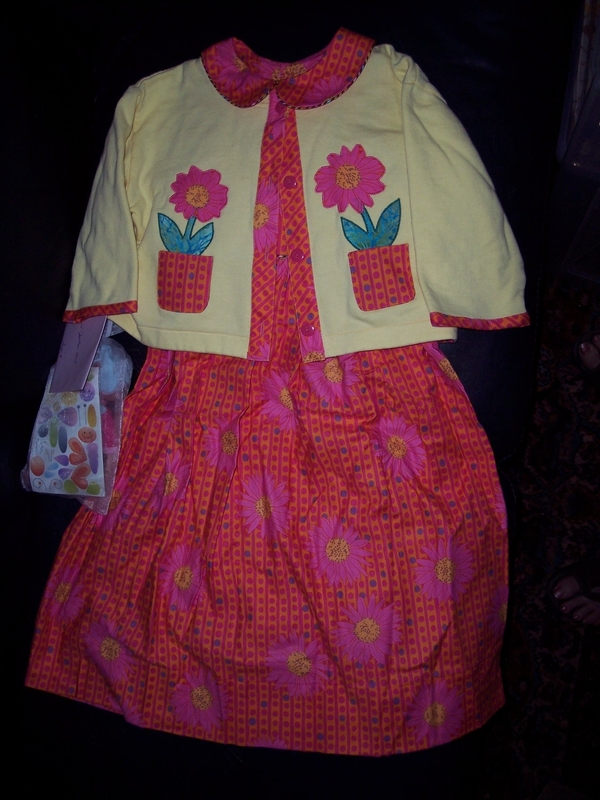 Dear Sue, Like so many others, I was thankful that you offered me a way to help the children of Joplin. Two years later, after Hurricane Sandy, our power was restored by a power company team from — Joplin! Wow Susan! God used you to serve his children in need in a wonderful way 🙂 Wish I had known about this, I would love to be involved in something so special. Sue, what a wonderful story. Of course, there would be no story if you had not found a way to help the children in Joplin by using your amazing talent. thank you and God bless you for doing this!